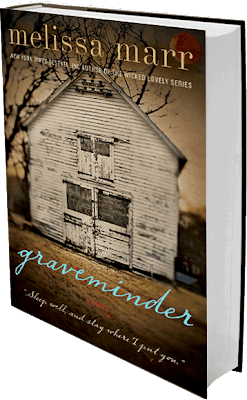 Graveminder was written by Melissa Marr. After reading and enjoying her Wicked Lovely series (I've read 8 of them) I was really interested to see if I would like another book by Melissa Marr... one not involving fairies. This novel is also considered her first work of adult (not young adult) fiction. I have to say I think I may have actually liked this novel better than the fairy stories. Rebekkah Barrow never forgot the attention her grandmother Maylene bestowed upon the dead of Claysville, the small town where Bek spent her adolescence. There wasn't a funeral that Maylene didn't attend, and at each one Rebekkah watched as Maylene performed the same unusual ritual: She took three sips from a silver flask and spoke the words "Sleep well, and stay where I put you."